RBNZ’s on the focus: NZDUSD long-held bearish outlook is still imminent, targeting below 0.66 levels by Q3’2019. That outlook is mostly driven by the expectations that the US dollar will resume its rise if the US economy remains stronger than most other major economies. Indeed, the Fed’s message today that it will probably remain on hold throughout 2019 should add a shot of stimulus to the US economy. In addition, today’s NZ GDP data tells us that the weakness in the second half of 2018 was not as bad as we had thought. That sets up the RBNZ to adopt a benign and largely repeated message about the OCR at Wednesday’s RBNZ’s monetary policy meeting for OCR Review. All this means NZDUSD to go vulnerable again to an upside break in the near term, above 0.6920 then targeting 0.6970, and above that 0.7060. In its first review of 2019, the Reserve Bank left the OCR at 1.75% as expected. The tone of the statement was more dovish compared to November, but it didn’t go quite as far in that direction as we or markets were expecting. The projected OCR track was around 20 basis points lower, with the RBNZ noting that it expects to keep the OCR at its current level over the next two years. The comment that “the next OCR move could be up or down” was returned to the statement, having been removed from the November statement after a run of strong data. NZDJPY’s rise remains intact, targeting the 78.0 area next in the near-term. Bearish outlook on a broader perspective targets 73 by Q3’2019 as the BoJ and government appear to be in no hurry to engineer inflation towards its 2% target, suggesting easier monetary policy is unlikely. Hence, short hedging via futures of mid-month tenors have been advocated and we now like to uphold the same strategy. Elsewhere, the ECB ceased QE bond purchases in last December, and rate hike plans are likely to be shelved but not abandoned. we target EURNZD 1.6870 levels in Q3 2019. Trades intricacies: As 6m IV skews of all NZD crosses have clearly been indicating bearish risks of kiwis dollar, the major downtrend continuation shouldn’t be panicked the broad-based bearish outlook amid minor rallies and the erratic nature of news flow is one reason why we had suggested NZDUSD, EURNZD, and NZDJPY shorts via options and futures in the recent past, we continue with the same strategies. While the NZDUSD trade is underwater following positive news reports on a US-China agreement. 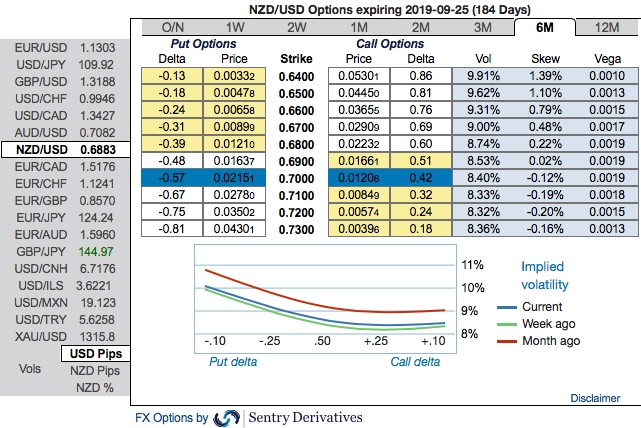 6m NZDUSD (1%) in the money put options have been advocated, in the money put option with a very strong delta will move in tandem with the underlying. Alternatively, on hedging grounds, we advocated shorting futures contracts of mid-month tenors ahead of US Fed’s monetary policy in the recent past, as the underlying spot FX likely to target southwards 0.66 levels in the medium-term, we wish to uphold the same strategy ahead of RBNZ’s monetary policy that is scheduled for this week. EURNZD (1%) ITM calls of 3m are advocated with a view of mitigating upside risks amid minor downswings. Currency Strength Index:FxWirePro's hourly NZD spot index is inching towards 25 levels (which is bullish), while the hourly USD spot index was at 24 (mildly bullish), EUR is at -8 (neutral) and JPY is flashing at 44 (bullish) while articulating (at 10:29 GMT).